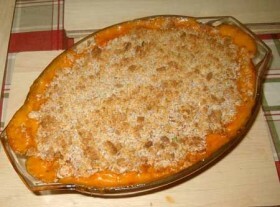 This is the best supper dish you could wish for, it is more savory than the usual macaroni dish. It is a real favourite with my family. Make your cheese sauce, I find to make a good sauce I like to use up all my old bits of cheese which could be any blue cheese or cheddars and edams, all makes for good flavours. While you make your cheese sauce, cook your macaroni for about 10-15 mins. Place in a large oven dish and sprinkle with the bread crumbs then place in the oven for about 15mins, till it is golden and bubbling. Best with a glass of red wine.